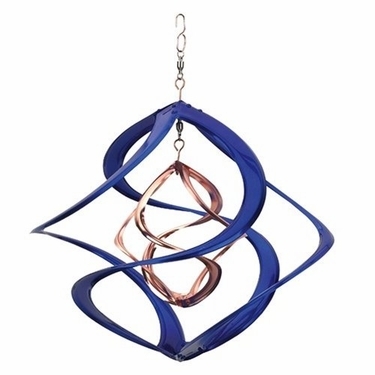 Our Blue Cosmix Metal Wind Spinner is a must-have if you're craving the peace and tranquility that an elegant outdoor piece can bring to your space. With its hypnotic, transfixing motion, this gorgeous spinner is perfect for your porch, garden or other outdoor space. In peaceful blue and glittering gold, this metal outdoor accoutrement lends its beauty to your home in light breezes or high winds. The outer spinner is 12 inches high and 10.5 inches wide, and its total hanging distance is 15 inches. Our Blue Cosmix Metal Wind Spinner comes with S-hook swivels that allow you to hang it easily, and it spins smoothly under any wind conditions!